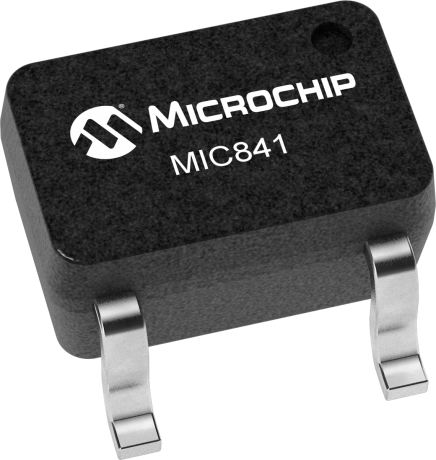 The MIC841 and MIC842 are micropower, precision voltage comparators with an on-chip voltage reference. Both devices are intended for voltage monitoring applications. External resistors are used to set the voltage monitor threshold. When the threshold is crossed, the outputs switch polarity. The MIC842 incorporates a voltage reference and comparator with fixed internal hysteresis; two external resistors are used to set the switching threshold voltage. The MIC841 provides a similar function with user adjustable hysteresis; this part requires three external resistors to set the upper and lower thresholds (the difference between the threshold voltages being the hysteresis voltage). Both the MIC841 and MIC842 are available with push-pull or open-drain output stage. The push-pull output stage is configured either active high or active low; the open-drain output stage is only configured active low. Supply current is extremely low (1.5µA, typical), making it ideal for portable applications. The MIC841/2 is supplied in Micrel’s Teeny™ 5-pin SC-70, 6-pin 1.6mm × 1.6mm Thin DFN (MIC841), and 4-pin 1.2mm × 1.6mm Thin DFN (MIC842) packages.